The $55.24 million The Moderne high-rise development has begun preparing for construction. Recently, the shipping container building that housed The Moderne’s sales office was packed up and removed from the site. Additionally, utility work is ongoing adjacent to the site as the property is being staged for construction. When complete the 30-story high-rise will have 203 apartments, 14 condominiums, and first floor retail. This project is located adjacent to the Park East redevelopment corridor and kitty corner from the recently completed Aloft Hotel. The project is being funding with $9.3 million in loans from the City of Milwaukee and a $41.4 million loan from the AFL-CIO Investment Trust. The city loans were approved despite concerns over the potential risk to the city, and the potential for over-saturation within the residential market in downtown Milwaukee. To obtain the city loans the development team, led by Rick Barrett, agreed to an Emerging Business Enterprise goal of 25%, a Residents Preference Program goal of 30%, and secured the personal guarantee with a first lien on assets of $3.3 million. Great looking building. Lets hope this attracts additional development in the area when the economy improves. @Agreed this is a great looking building, and each project like this essentially nibbles at the edges of the Park East, which is how it needs to develop, so yeah I think it an be catalytic. Further, it will take two years to build so by the time it is open we will likely be out of the recession. Great looking building…not needed in Milwaukee. Too much inventory of market residential…should have been marketed affordable. If this building would have been marketed as affordable units, cuts could have been made to design cost and the city wouldn’t have had to risk $9m taxpayer dollars on a housing project that just isn’t going to fill up…ever. I’d be surprised if occupancy exceeds 60%. @incdragger – I have to agree. I think the downtown is going to be awash in condos somewhere between 1 to 5-years. The expectation for tax revenue based on all of this building won’t pan out. Then I foresee a lot of $$$ problems for City Hall. Think we can’t fund our city parks properly now…? @Jeffery “I think the downtown is going to be awash in condos somewhere between 1 to 5-years.” A couple things. This is primarily an apartment building, only 14 condos. And it won’t even open until somewhere around February 2012. Finally, despite all the talk of empty condos the top 10 condo projects in the 3rd district pay more in property taxes than two Aldermanic districts. Point being condo development has been far more positive for Milwaukee than negative, in regards to tax base. This loan is backed up with a TIF, so even if it takes many many years to pay back, the risk is considerably alleviated, and there is in fact property backing at least 1 of the loans. Ummmm the vast majority of parks are County Parks, not City Parks. @Dave Reid – I stand both corrected and enlightened. @Jeffrey To be fair there is of course of level of risk, but because of the items in my previous comment, I believe the city will come out a head on this one. To me the big assumption is that by 2012 the economy will be close to normal. Very exciting! This is exactly what the Park East area needs to attract new development in a down market. Marcus’ recent commitment to a new, upscale movie theater on Water Street is another huge step in the right direction. I can’t wait to watch this one go up. Just the nicest building Milwaukee will have built in years. It is going to be exciting, great to see creation in process. I spoke with one of the structural engineers and he said it is getting really close to being under way. We’re hoping to take some of the students over to see the foundations going in. 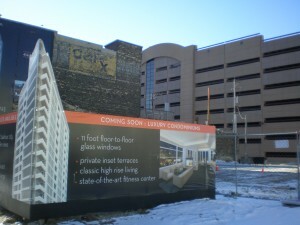 I am very hopeful for this building, and the mix it brings to downtown Milwaukee. It was a smart move to scale back the condo portion of the project and bring in more apartments to the mix which most likely will do better in the foreseeable future. Who is to say what the market will bear in the next two years when this building in finished. People tend to be very pessimistic about the condo market here but they tend to sell non the less. So regardless of how negative the so called experts seem to be, condo still seem to sell here regardless, and at the hight prices, so I guess people can say what they want. The market will always to what it will do, and I think a little speculation in Milwaukee couldn’t hurt for a change. As for this building, this is one of the nicest and well designed building I have seen in a long time in Milwaukee. Excellent job.